This Spitfire was ordered on June 9th, 1940 and went into action on October 8, 1940 with No. 609 Squadron, Middle Wallop, Hants. This past April I had the opportunity to visit London for the first time with my wife. We especially enjoy history and England is loaded with many lifetimes’ worth of historical stuff. There were quite a few things I wanted to see, but historic fighter planes were on the top of my list. I’ve been an admirer of WWII aircraft ever since my grandfather took me to see the movie Empire of the Sun in 1987. The scene where Christian Bale’s character was standing on the internment camp’s watch tower and saw a P-51 Mustang for the first time was epic! While the P-51 is America’s darling fighter war machine, for the RAF it was all about the Spitfire. Britain’s Spitfire is renowned for enabling the defense of their kingdom against nearly impossible odds. I had to see this iconic machine in person! This Percival Mew Gull set the fastest time ever recorded for a British aircraft in the King’s Cup air races and a world record time between London – Cape Town – London which in its class stands to this day. Though the Imperial War Museum is highly recommended, the best place to see a Spitfire is at the RAF museum. 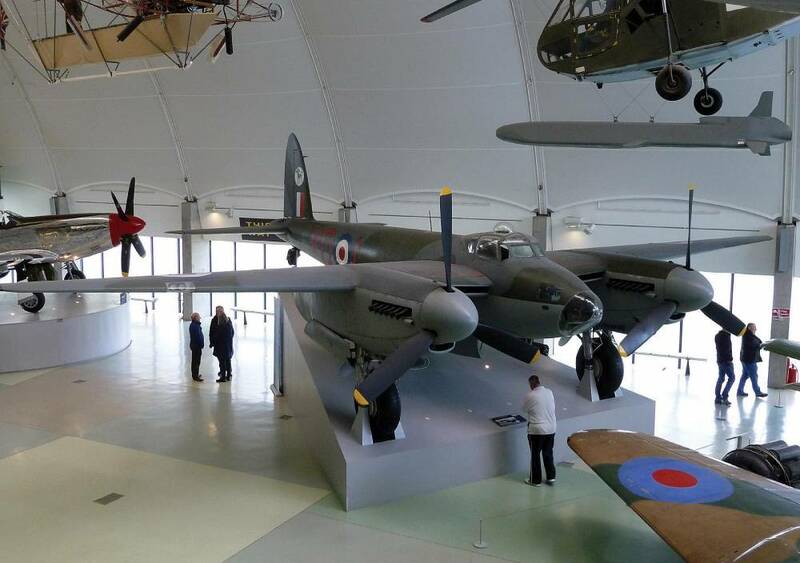 Fortunately, the RAF has a museum accessible via the Tube less than an hour outside of London, just a few minutes walk from the Colindale Tube station nestled in London’s suburbia. The museum looked deceivingly small on approach, but as we found out, it was cavernous and chock full of all things related to aviation. The museum’s gate guardians are full size fiberglass replicas of a Supermarine Spitfire and a Hawker Hurricane. They use the fiberglass replicas so that genuine, irreplaceable aircraft examples are not exposed to the deteriorating effects of mother nature. They’re also a lot cheaper and easier to maintain. So, while the fiber fighters were lovely, I was anxious to see the real deal! This museum has free admission, but donations are appreciated. You can donate cash outright or buy a program. Once we passed the reception desk we discovered a chrome, full-size Spitfire up on the wall, again, lovely and shiny, but still not the actual machine! The adjoining wall was decorated with a cool visual history of the famous Roundel emblem and all its variations. After passing through the reception area displays, we walked into a pseudo airport control tower that overlooked a massive hangar full of aircraft! What was especially engrossing about the display was the variety of aircraft. A Eurofighter Typhoon hung near an airship observation gondola. There were informative plaques along the railing that each had a photo and fascinating information on international WWI and WWII aces. We continued by walking around the second-floor promenade, where we saw several unusual aircraft hanging from the ceiling. 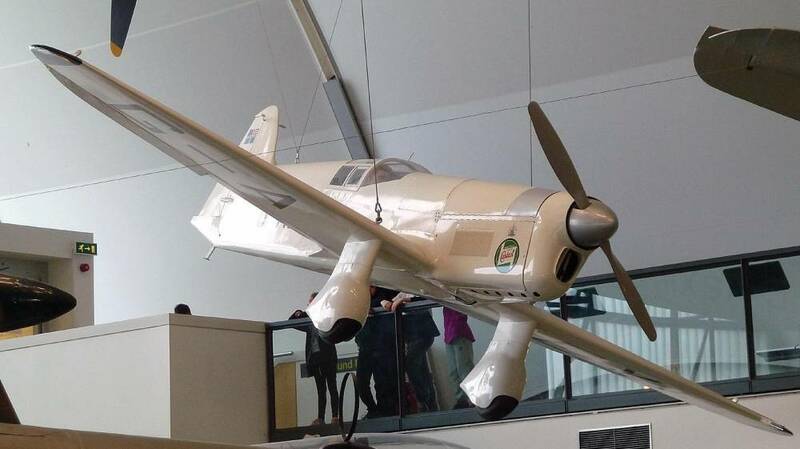 A highlight was a 1936 Percival Mew Gull; the sleek, white, fast-looking prop racing plane designed by Captain Edgar W. Percival that had won the Folkestone Aero Trophy in 1937. It was a stunning aircraft; unfortunately for me, Seagull Models’ radio control version is discontinued. 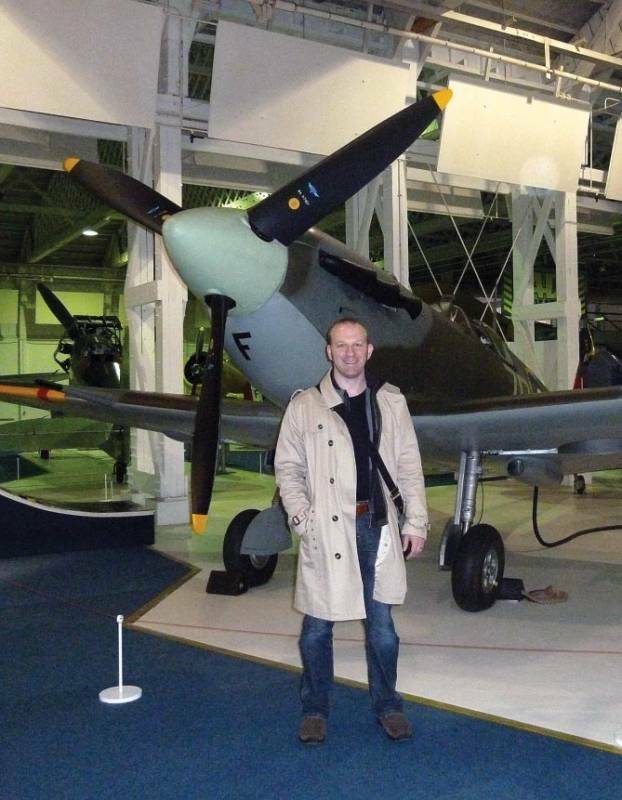 The author in front of a Spitfire. 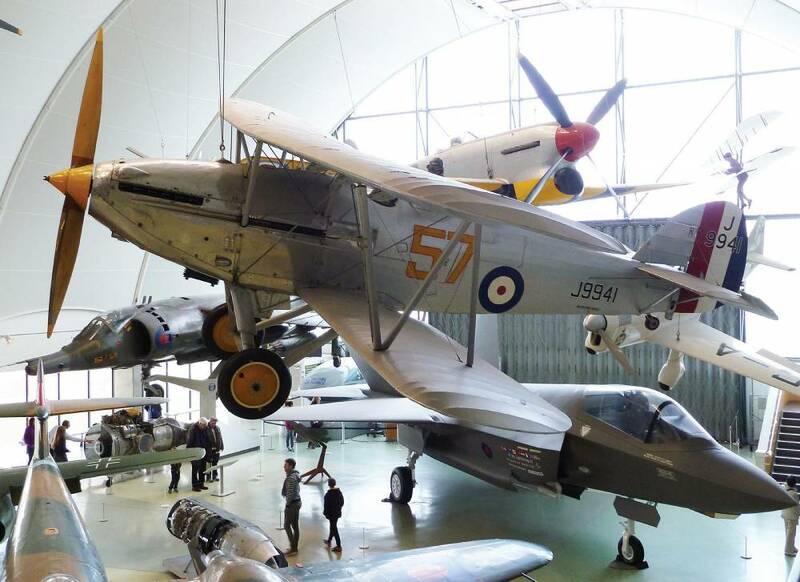 Once we stepped down to the main floor we found before us a menagerie of fabulous aircraft from a modern Lockheed F-35 to a “Wooden Wonder” de Havilland Mosquito. Further back toward the glass windows sat a pristine P-51D on a huge pedestal. It looked as though it had just come off the assembly line with a little extra polish. I was able to take our picture in its reflective cowl. Yet another devilishly iconic aircraft on display was a German Messerschmi Me-262 fighter jet. While not in flyable condition it was externally complete. I had never seen one in person; it was a remarkable machine. It was quite small, basically a cockpit with wings and two jet engines strapped together with canons at the nose. Many allied prop-driven fighters chased this first jet in the war; only a handful were able to shoot them down. We were quite impressed with the variety and quantity of aircraft in this first hanger, but there was quite a lot more yet to see! We passed through the next door and entered into a cavernous hangar that contained a massive amount of huge bombers, more fighter aircraft, armament, support vehicles and informative displays. We started by checking out a video on display about British engineer Barnes Wallis and his spherical, bouncing bomb project. Certainly crude by today’s armament standards, but at the time it was a highly advanced apparatus, even though it had controversial military success. During its primary mission it did cause a dam to rupture, unfortunately many of those who perished as a result were civilians and friendly troops. It proved to be ineffectual at impacting Germany’s ability to wage war. A Short Sunderland MR5 equipped with rockets. Also known as the “Flying Porcupine”. After a walk around this hangar we entered into an even larger expanse and there sat the incredibly huge Avro Lancaster bomber. These bombers are now scarce, but this one appeared complete and just so large, it was hard to imagine how this machine flew. What made this aircraft seem even more tremendous was that it completely dwarfed a nearby Boeing B-17G. The size disparity was quite shocking! Despite having been somewhat flabbergasted by the enormity of the Lancaster, it wasn’t the largest aircraft in the hall. That honor was held by an Avro Vulcan B2 bomber. It was so large that it barely fit in the hall. The tip of its nose cone was literally an inch or two from the inside corner of the building. With a wing- span of 111 feet, the enormity was just awe inspiring. The Vulcan was parked in the hall in such a way that you could only walk under it. It’s tunnel-like bomb bay was open where any variety of armament or supplies could have been readied to drop. The staggering footprint and shadow was mind boggling! Also in this hanger was a very unique display of a recovered Handley Page Halifax bomber of No. 35 Squadron RAF. On the night of the April 27th-28th 1942, this aircraft took part in a raid in Norway on the German battleship Tirpi —its first operational flight. It was hit by anti-aircraft fire after releasing the four 1,000-pound mines it carried and the pilot made a successful belly landing on the frozen surface of Lake Hoklingen. The crew escaped to Sweden with the help of the Norwegian resistance, except for the Flight Engineer who remained behind because of a broken ankle and was taken prisoner. Within hours, the aircraft sank through the ice into 89 feet of water. A German V2 rocket bomb. Over 3,000 of these were launched against Allied targets by the German Wehrmacht. In the summer of 1973, it was recovered from the lake by a team of divers from the RAF and a Norwegian diving club and was transported to the UK on a British Army Landing craft tank. 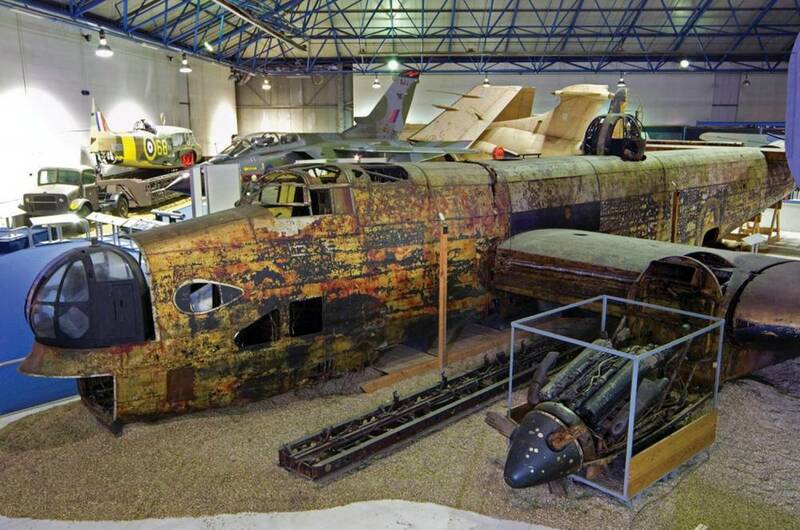 It is displayed in its “as recovered” condition in the Bomber Command display at the museum, apart from the nose turret which had already been restored prior to the decision to leave the remainder of the aircraft in stabilized, but original condition. The museum had many unique non-air- craft focussed exhibits. There was a walk- through diorama of a bombed factory that gave insight on how factories dealt with bomb damage and evolved to return to manufacturing quickly. They also had a down- scaled replica of a British airfield control tower. The type of tower with the balconies where commanding officers would watch the fleet take off and anxiously await the last of them to come back. There were also many ancillary pieces of support gear and vehicles. Everything from armament carriers and crew transport vehicles to fire apparatus. a Gazelle HT3, Wessex HCC4 and a bright yellow Whirlwind HAR 10. These aircraft were in fabulous condition! Once we were done seeing the rotary aircraft we walked on to where the hall resumed displays of fixed wing aircraft and related paraphernalia. Several piston engines were on display alongside various pre-WWII aircraft. The machinery was quite impressive given the manufacturing limitations of the time. Having worked as a machinist, I took some time to appreciate the level of craftsmanship of these mechanical marvels. They were quite intricate, much like fine watches. RAF as a Japanese-South East Asia campaign replacement for the Hurricane during WWII missions over Burma. There was yet another iconic aircraft with its unmistakable shark mouth painted cowling, a Curtis P-40N Kittyhawk IV. This was the P-40 series’ ultimate, highest performing final version. It was in spectacular condition and was a favorite of my wife primarily due to it’s classic nose art. After checking out several more great aircraft we finally came up to a display of three stunning Spitfires! One of them was open to sit in the cockpit for $8£ (reservation required), but I was content enough to just enjoy their beautiful lines from the outside. They had an F24, Vb and Mk XIVE versions on display. The Mk XIVE was the Spitfire’s last incarnation and was heavily modified from the original Mk I. With a five-bladed prop, increased power and other refinements, it was the pinnacle of its kind. This version entered the war late in January 1944 and was used amongst 15 squadrons of the 2nd Tactical Air Force and shot down over 300 V1 flying bombs during June 1944. 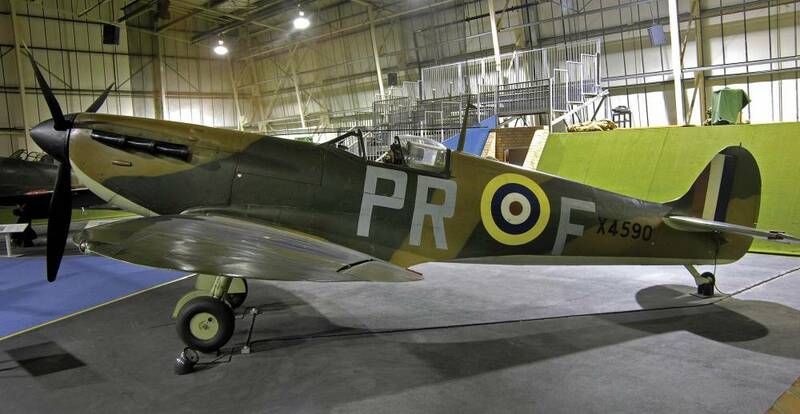 The Spitfire XIV was intended for high-altitude combat and was very effective in this role; the one we saw was one of 957 of this variant built. It was thrilling to see the UK’s most famous fighter in person. I certainly still love the Mustang, but the Spitfire was a truly remarkable machine that I absolutely became enamored with. It was the UK’s primary defensive machine for London during the Ba le of Britain in 1940. Winston Churchill summed up the effect of the battle and the contribution of the combined RAF Command forces and the Fleet Air Arm with the words, “Never in the field of human conflict was so much owed by so many to so few.” Those “few” were mostly Spitfire pilots who jumped into action to protect the heart of the Anglican Empire against the Nazis’ Luftwaffe. Ths Handley Page Halifax II’s last mission was targeting the Bismark’s sister ship Tirpitz in direct retaliation for the Bismark’s sinking of the HMS Hood. After finally getting a respectable bit of time and pictures with the Spitfires we decided to hit up the gift shop. Not surprisingly, there were loads of model aircraft by die-cast model maker Corgi. There were all sorts of trinkets, badges, key-chains and decorative paraphernalia available for purchase. Some art pieces that depicted the Spitfire, Hurricane and Lancaster seem to have followed me home. 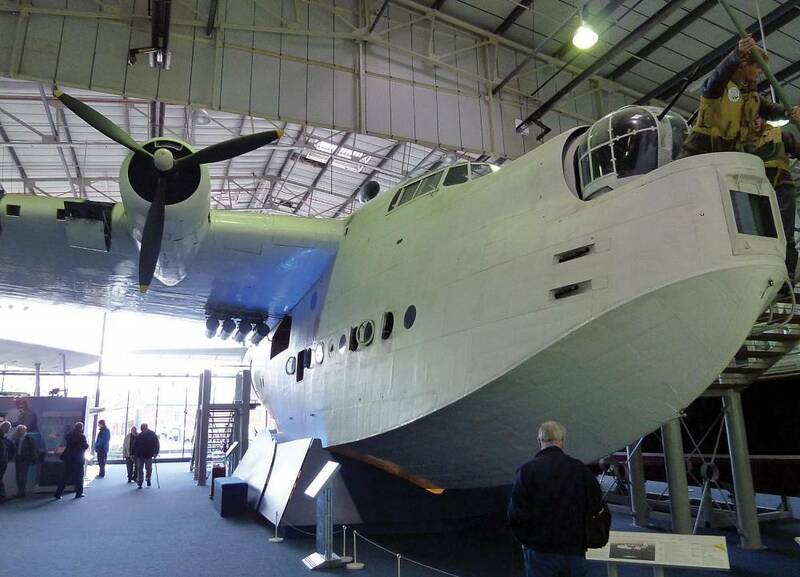 and was the first British flying boat to have power-operated gun turrets as part of its defensive armament. This strong, protective armament resulted in the Germans giving it the nickname ‘Flying Porcupine’. In another part of this hanger was a replica of an RAF airfield defensive system for the aircraft. This was a unique system of berms built in a E-shape to be er protect aircraft under attack from spreading damage to an adjacent aircraft. Within this display was yet another Spitfire, a German Messerschmi Bf-109 fighter and a Bf-110G-2 bomber. Many of these aircraft were in various states of disassembly for the purpose of a conservation survey in preparation for a transformative RAF centenary exhibition in 2018. Specialist teams from both the London and Cosford branches of the museum have been working together to meticulously disassemble, inspect and make necessary repairs for redisplay. 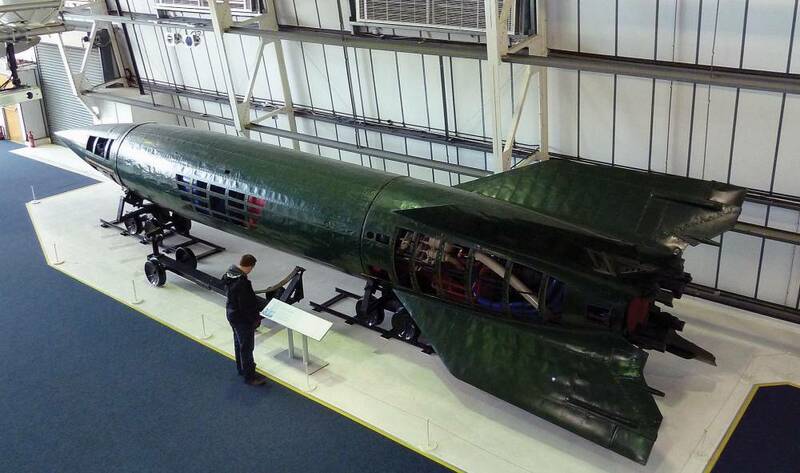 It’s a tremendous project and several aircraft will be moved around between the London and Cosford locations. There were more displays of various German and British aircraft along with a V2 rocket. By this time my wife and I were starving! Fortunately, this hanger had a really nice restaurant with delicious burgers. While we sat and ate lunch we overheard a former Mosquito pilot retelling a tale from his days of service. It was quite a befitting scene given our whole experience at the museum. We had such a wonderful time at the museum, but had to promptly be back on our way to London to keep on schedule. After we had go en back to our hotel room I realized that we had totally forgo en to visit the WWI exhibits hangar! Oh well, given the centenary transformation program and certainly other changes, we’ll have plenty of reasons to visit again.